Special Prosecutor Bob Mueller just sent a message to Donald Trump in the form of an indictment of his former campaign chair and a guilty plea by a former Trump foreign policy advisor. 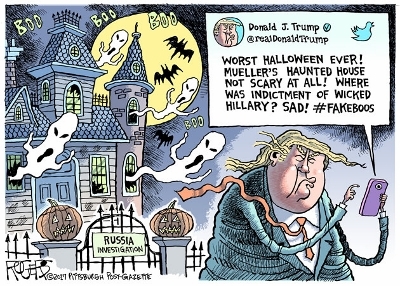 Mueller's message: How you like my witch hunt now, Mr. President? Re: Honor, Sacrifice and Imperial Duplicity: Four Dead in Niger. Anybody Know Why? 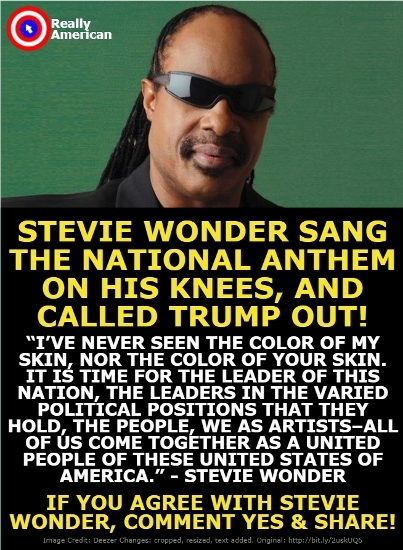 Probably had nothing to do with Trump direction, I doubt if before this incident he could find it on a map. Special forces of the US are all over the map now, in something like 140 countries, well over half the countries in the world, doing god only knows what. The USA has designated itself as the world's policeman and has kept its presence in over 140 countries hidden from the taxpayers that foot the bills. No reason is ever given, not even in situations like in Niger. Send troops! Who needs help with things like clean water or good food? That would not profit the military contractors. Did he just say the US is invading sovereign nations? Worked with an Indonesian who spoke of the horror and who lost a brother in the purge. Another case of Americans propping up a viscous tyrant because he supported their war against "the red menace", for more look to Guatemala, Honduras, El Salvador, Chile, and Dominican Republic, among others. Imperialism through client state proxies, sad legacy. Boricuas must understand that only we can rebuild PR again.The Carpetbaggers are vultures circling the carcass of a wounded island.The main interest from the north is only monetary and self interest.Whatever help comes must be used wisely and keep the Present Government from stealing and wasting on contracts for their friends.Boricuas you must get up and claim your rights and benefits. First U.S. colonizes; now the Trump Administration does nothing, except throw paper towels; then the Trump Administration gives contract to re-build electric grip to tiny company with only two employees - but they are big-time financial contributors to Trump, the GOP and the alt-right; now in turns out this government contract awarded by the Trump Administration is not subject to audit. Almost one hundred years ago this was called the Teapot Dome Scandal, and brought now one presidential administration. Now we need to bring down another, and Congress as a whole. I doubt the gov't can grant anyone immunity from supervision while spending public money. I fear this is only the start. Look what they did to New Orleans. It’s about to become an oil town! African-Americans should avoid flying American Airlines, until the company addresses allegations of racism and unfair treatment of black passengers, the nation’s oldest civil rights group has urged. The NAACP issued the rare national warning Tuesday evening, citing a series of incidents that it said proves the airline routinely subjects African-Americans to “disrespectful, discriminatory or unsafe conditions.” Incidents include American gate agents booting blacks from flights after arguments with personnel and agents making unrequested seat reassignments, the group said. “The series of recent incidents involve troublesome conduct by American Airlines and they suggest a corporate culture of racial insensitivity and possible racial bias,” the NAACP said in a statement. In 1999, NAACP called for an economic boycott of South Carolina over the Confederate flag, though it ended it in 2015, and this year, it issued a U.S. travel advisory in Missouri, where it believes black Americans face a substantial risk of harm on the ground. The American Airlines travel advisory is the group’s way of ensuring the company’s alleged practices aren’t dismissed or normalized, NAACP President and CEO Derrick Johnson said in a statement. 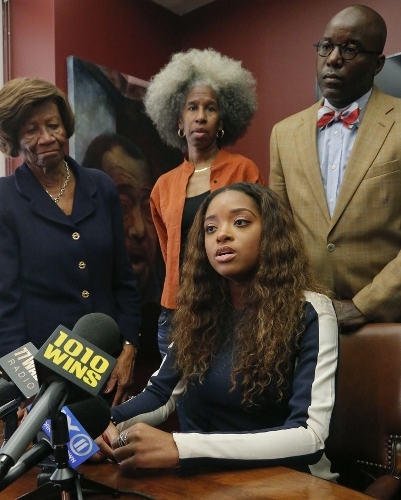 NAACP New York State Conference President Hazel Dukes, far left, stands near civil rights activist Tamika Mallory, seated, as she speaks during a press conference about being kicked off of an American Airlines flight, on Oct. 17. Did you know that Fred Hirsch, a retired plumber and delegate to the South Bay (San Jose) Labor Council, led a drive that got the California state fed to pass a resolution calling on the national AFL to open the books on AIFLD -- which they didn't? See Labor Notes article from 2004 here. Kim Scipes, this article's author, also recently published a book on the subject, I think. A killer version of Woody's classic, all rough edges, as much rant as lament, with whispers to carry the sorrow. Really, I am completely shocked. Who would have thought that a narcissistic billionaire who inherited his money and never stepped outside of a country club, and who has a history of screwing over every little guy he dealt with would do a thing like that. Draining the swamp? I'd say he is feeding his own alligators. Re: Does the Western Left Have an African Problem? This article is deficient in not looking at what happened. The USSR's economy collapsed from the burden of having to fend off the US. The USSR had been the funding as well as international support nation. And that financial as well as political support in the UN and elsewhere was important in maintaining the national liberation struggles. Since that time the US has "pivoted" on Africa hoping to maintain western dominance across the continent taking the resources while letting the people starve or die in wars that are often the result of a mix of poverty and nationalism. The CIA helped kill off the progressive leaders. RARE ART AT THE POST OFFICE! Below, a section from the huge 1941 mural by Victor Arnautoff, a protege of Diego Rivera. It was on display 35 years in the Richmond California P.O., then put into storage and forgotten. Now it's in restoration and a facsimile is on exhibit at SF Labor Archives at SFState. Richmond in WW2 was an industrial powerhouse: women and men working 3 shifts/day. Another excerpt from the mural in the comments below shows a postal worker and townfolk. good, gorgeous news. thanks Miriam for posting. What luck. In your research, have you run across more about Arnautoff? I met Victor once at the California Labor School and admired his work. Also along with others, painted murals at Coit Tower. Victor was a fine and decent man. An undocumented teenager, referred to in court documents as Jane Doe, has been at the center of a lawsuit with the Trump administration over her right to have an abortion. The ACLU took the government to court and won - Jane Doe finally obtained the procedure she wanted. The 17-year-old is detained in a refugee resettlement shelter and had the abortion on Wednesday. The Trump administration spent a month trying to stop her from accessing an abortion. 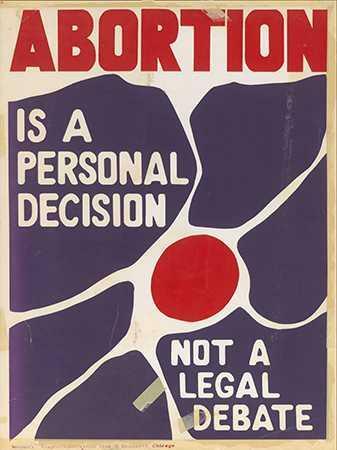 But attacks against reproductive rights continue. Earlier this month, the Trump Administration rolled back the Affordable Care Act's contraception coverage requirement. There is no doubt that more attacks are coming. We must continue to organize and fight back. We won't go back. We'll stream live from Jacobin's Facebook page, and keep it available for free at the videos tab. 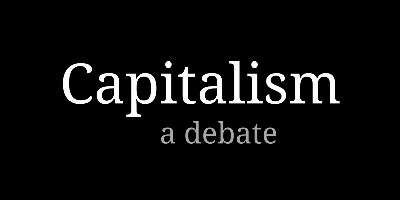 Is capitalism the best way to improve standards of living, ensure political and economic freedom, and provide opportunity? Could socialism do better? A debate between Reason and Jacobin. Reason is the libertarian magazine of "Free Minds and Free Markets"
Nick Gillespie is editor in chief of Reason.com and Reason TV, the online platforms of Reason. Katherine Mangu-Ward is editor in chief of Reason and a Future Tense Fellow at New America. Vivek Chibber is a professor of sociology at New York University and the co-editor of Catalyst: A Journal of Theory and Strategy. His latest book is "Postcolonial Theory and the Specter of Capital." Bhaskar Sunkara is the founding editor and publisher of Jacobin. From taking a knee to taking down Confederate monuments, movements for racial and economic justice are creatively confronting the backlash of white supremacy unleashed by the election of Donald Trump. What does this presidency and the larger takeover of government by the far right mean for African Americans, and how should we fight it? How do we strengthen movements for police accountability? What does coalition-building look like, and who’s the base for what type of anti-Trump alliance? How can we translate social media outrage to power in the streets and the ballot box, and to a broader alliance against the rising tide of inequality? Shaun King is a journalist and activist. He is senior justice correspondent at the New York Daily News and a political commentator for The Intercept. Shaun has leveraged his social media platform to place a spotlight on intersections of popular culture, police brutality and economic inequality. Bill Fletcher, Jr. is a writer and activist having spent most of his adult life in the trade union movement. He was a cofounder of the Black Radical Congress and a former president of TransAfrica Forum. He is a partner in Common Forces, LLC and a senior scholar with the Institute for Policy Studies (IPS). What does an American look like? Who is welcome in this country? What is every American’s duty in the face of racist government action? Map of the Camps in Then They Came for Me, Alphawood Gallery, 2017. 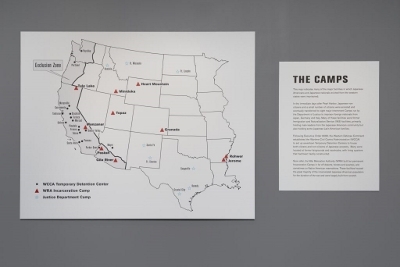 Alphawood Gallery has partnered with the Japanese American Service Committee (JASC) to produce the Gallery’s first original exhibition, Then They Came for Me: Incarceration of Japanese Americans during WWII and the Demise of Civil Liberties. This exhibition examines a dark episode in U.S. history when, in the name of national security, the government incarcerated 120,000 citizens and legal residents during World War II without due process or other constitutional protections to which they were entitled. Executive Order 9066, signed by President Franklin D. Roosevelt on February 19, 1942, set in motion the forced removal and imprisonment of all people of Japanese ancestry living on or near the West Coast. During this 75th anniversary year of the executive order, we look back at this shameful past to learn lessons for our present and future in the face of new challenges encouraged by fearmongering and racism at the highest levels of government. Then They Came for Me presents this historical event from multiple perspectives. Drawing upon the powerful images culled from the book Un-American: The Incarceration of Japanese Americans During World War II by Chicago-based photo historians Richard Cahan and Michael Williams, the exhibition features works by renowned American photographers Dorothea Lange, Ansel Adams and others documenting the eviction of Japanese Americans from their homes and their subsequent lives in incarceration camps. 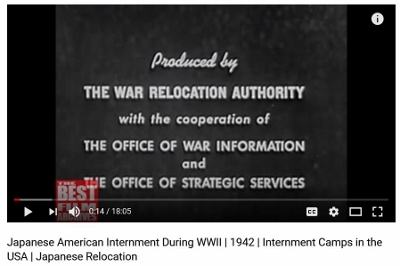 These photographers were hired by the U.S. Government’s War Relocation Authority (WRA) to record the “evacuation” and “internment” process. In addition to the WRA photographers, the exhibition presents views of the incarceration by Japanese American artists Toyo Miyatake and Miné Okubo. A significant group of images by Miyatake, a professional photographer who was incarcerated at the Manzanar Relocation Center, reveal details of the camps prohibited in WRA photography such as barbed wire and guard towers, and are shown alongside his illuminating images of the imprisoned residents’ daily lives. And pages from Miné Okubo’s remarkable illustrated memoir Citizen 13660 document her own incarceration experience with poignant drawings and forthright text. The JASC and a number of collectors from the Chicago area have generously lent art, objects, documents and other historical materials that provide glimpses into the personal experiences of those who were incarcerated. Highlights include ID cards and tags, anti-Japanese propaganda, suitcases, diaries, handmade furniture, wood carvings and other works of art, high school yearbooks and newsletters produced by camp inmates, military accoutrements, indefinite leave clearances, materials related to resettlement in Chicago and eventual redress and reparation. Specially compiled video testimonies by former inmates, their family members and community leaders are installed throughout the exhibition. And the new documentary film And Then They Came for Us by Abby Ginzberg and Ken Schneider, screened daily, makes explicit connections between the Japanese American incarceration story and current concerns with regard to the treatment of Muslims and Muslim Americans. The 12,000-square-foot space first served this purpose for the Chicago presentation of the groundbreaking national touring exhibition, Art AIDS America, which was on view from December 1, 2016 to April 2, 2017. Our new exhibition Then They Came for Me: Incarceration of Japanese Americans during WWII and the Demise of Civil Liberties will be on view from June 29 until November 19, 2017. "Right after Pearl Harbor, the soldiers came to get us," says actor George Takei in the new documentary And Then They Came for Us from filmmakers Abby Ginzberg and Ken Schneider. Takei was one of 120,000 Japanese Americans imprisoned in concentration camps 75 years ago in the name of "national security." He was five years old and, like the majority of prisoners, an American citizen. 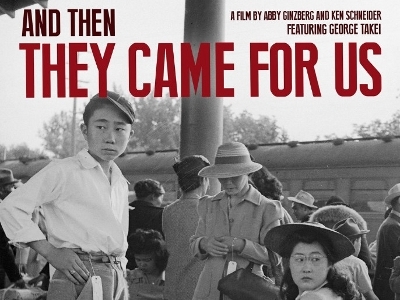 And Then They Came for Us chronicles this painful chapter in American history, and follows the efforts of Japanese American activists determined to fight further acts of government-sanctioned racism like a Muslim registry and travel ban. Capital & Main is a proud media sponsor of the Los Angeles premiere of And Then They Came for Us. Please join us for the event on Monday, Nov. 27th at 7 p.m. at the Downtown Independent Theater. There will be a Q&A with George Takei, filmmakers and special guests following the film.